A cosmic disaster on a tabletop far, far away. 1/40 sec., f/5.6, ISO 400, 35mm. CREATING FANTASY IMAGES ON A TABLETOP IS A LITTLE LIKE WATCHING YOUR GRANDMA IN THE KITCHEN, if your grandma (like mine) was the “I-don’t need-no-recipe”,a dash here, a pinch there kind of cook. Sometimes I think she just kept chucking ingredients into the pot until it was either the right color or the correct thickness. All I know is, when she was done, it “ate pretty good”. I use the same approach when I am building compositions from scratch. You’re not sure what the proportions are, but you kind of know when you’re done. One of the photo sharing sites that I recommend most enthusiastically is called UTATA, a site which promotes itself as “tribal photography” since it require a certain level of communal kick-in from all its members, posing workshop assignments and themes that take you beyond merely posting your faves. Operating in tandem with its self-named Flickr group, UTATA is about taking chances and forcing yourself, often on a deadline, to see in new ways. If it sounds like homework, it’s not, and even if you have no time to work the various challenges, you’ll still reap a vast wealth of knowledge just riffing through other people’s work. Give it a look at http://www.utata.org. One of the site’s recent so-called “weekend projects” was to photograph anything that in any way depicted broken glass. No special terms beyond that. Cheap glass, wine glass, churchy stained glass, pick your texture, pick your context. I decided to so something with a shattered light bulb, but with a few twists. 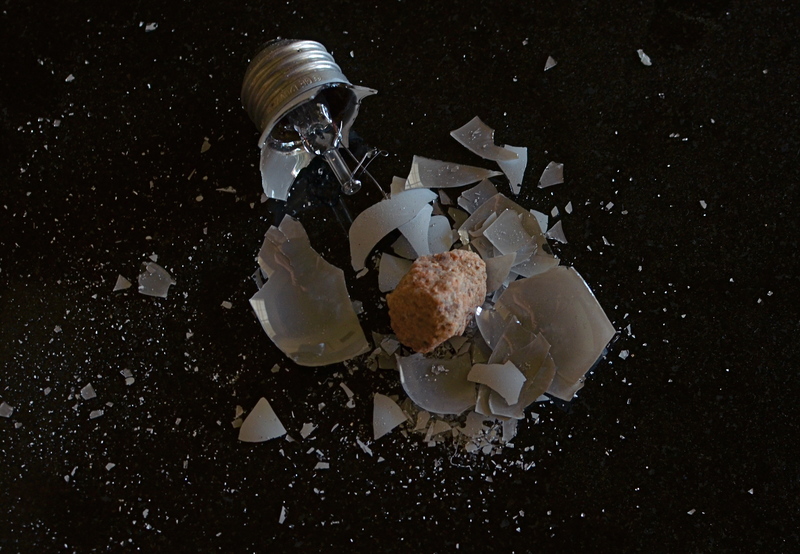 Instead of just breaking the bulb and shooting a frame, I opted to place the bulb in a food storage bag, then hammer it until it burst. Due to the sudden release of pressure when light bulbs are breached, they don’t just crack, they sort of explode, and, given the chemical treatment of the glass, there is a lot of pure white dust that accompanies the very fine glass particles. Breaking the bulb inside the bag allowed me to retain all that sediment, then make it more visible by pouring the bits out onto a black, non-reflective surface…in this case, a granite tile that I use to model product shots on. I already liked the look of all the atomized white dust across that dull blackness, rather like a “star field”, or a cluster of debris, scattered across a vast void in space. The effect was taking shape, but the “garbage cook” inside my head was still looking for one more ingredient. The great thing about building a fantasy visual is that it doesn’t have to make “sense”….it just needs visual impact sufficient to register with the gut. If the micro-fine bits of the bulb represented some kind of space catastrophe, where was the cause? Inner stresses, like volcanoes, rupturing the Mother Bulb asunder like the planet Krypton? No, wait, what if something collided with it, some asteroid-like something that spelled doom for Planet G.E.? A quick trip out to the back yard gave me my cosmic cataclysm….I mean chunk of quartz, and the rest was just arrangement and experiment. What does it all mean? Heck, what does beef stew mean? Making a picture can be like gradually adding random veggies and spices until something tells you it’s “soup”. And with tabletop fantasies, you get to play God with all the little worlds you’ve created. Hey, over a lifetime, plenty of other people will take turns blowing up your work. This entry was posted on June 11, 2013 by Michael Perkins. It was filed under Composition, Exposure, Framing, Macro, Patterns, Still Life, Tabletop and was tagged with Composition, Crafts, fantasy, Incandescent light bulb, patterns, Tabletop, Textures.